Halfway through the interview, Levi van Veluw picks up his laptop to show something. Ten minutes and an exposé with highlights from the history of architecture and objects from all possible beliefs later, and it is clear how thoroughly Van Veluw has immersed himself in the question what characteristics design must have in order to give the viewer the impression that he is in a sacred environment. He paid attention to apparent details such as the height of an altar, the light behind it, the height of the church ceiling, the design of the interiors and the quality of the materials used. Van Veluw himself chose, as always, for handicrafts and for a material that is new to him: clay. Almost immediately after he finished his education at ArtEZ Levi van Veluw (1985) gained international attention with the Ballpoints series, which landed him the International Photo Award in New York in 2008. His work has been shown all over the world since. This flying start meant that Van Veluw did not get the chance to discover himself as an artist. So it was not possible to work quietly on fixed themes and slowly become known to a wider audience. Van Veluw did so with the art world closely watching his every move. Beyond Matter is Levi van Veluw's fifth exhibition at Galerie Ron Mandos. In the 2011 series The Origin of the Beginning, Van Veluw investigates his desire for structure. He depicted his family and family life in wooden blocks. This way, he gave structure to his immediate environment that was lacking at home during his childhood. Unlike what is often assumed, the images from The Origin of the Beginning were not made with a computer program, but by hand. All wooden blocks and slats were made by hand and the whole thing was then photographed and filmed. The latter is typical of Van Veluw. Why would you take up so much work if you could achieve the same with a few mouse clicks? The answer is that Van Veluw starts from a concept. In this case: why do I attach so much value to giving structure and regularity to my life? Then Van Veluw says: “I consciously stay away from philosophy. Philosophy in art guarantees bad philosophy. I am a visual artist in the literal sense of the word. My strength is to work out an idea in images. The question is: how do you convert a concept into material? " The materials do not have to be the same every time. According to Van Veluw, you cannot become a substantially different artist, but it is important to keep looking for other forms and materials to tell your story. For example, Van Veluw made drawings, sculptures, film, photography and installations and used many materials over the years: from the green materials from modeling for Landscape (2008) to wood, clay and glass for Beyond Matter. In recent years, the theme of structure has faded into the background, but for his penultimate show Veneration (2017) and now with Beyond Matter, Van Veluw goes back to a theme with which he has a history: faith. Van Veluw grew up in the Dutch Bible Belt and although not himself not a religious person, the Christian faith played a role in his life. With the Veneration series, his research into the visual language of beliefs began; works in this series also have titles such as Pentaptych and Sanctum. The question is: if we worship something immaterial, why does faith need a visual language and rituals? Pentaptych and Sanctum both consist of countless wooden slats and are made of cobalt blue. They look perfect. Even so perfect that Van Veluw was regularly asked if it was manual work. In response, he started looking for a material for Beyond Matter that would not raise that question, simply because it would never be straight. A material in which you can still see the fingerprints of the maker. That material is clay. The choice of clay also meant that Van Veluw had to familiarize himself with working with that material - from the correct mixing of the blue pigment to baking, everything was new. That required a huge investment in time. The elaboration of the concepts will also not have happened overnight. If you look at the elaborately detailed altarpiece Beyond Matter or the rose window Circular Ornament, that question will surface sooner or later. Van Veluw has clearly thought about everything. This is also apparent from his use of colour - Berlin blue for the works in clay, cobalt blue for the works with wood. Every colour evokes associations among viewers, these types of blue are not typical of religious forms and thus emphasize the shape of the objects. "That way you can direct the viewer," says Van Veluw. “The trick is to include viewers in the idea as much as possible; you can do so by playing with context, in this case with the gallery, the materials, and the colours. In the context of the gallery, it is useful when a work clarifies the other works. " For Beyond Matter, Van Veluw created a small altar called Shrine with that function in mind. In front of the altar are trays that believers can slide into the altar. These trays evoke (for example) associations with the letters that faithful Jews entrust to the Wailing Wall. At the exhibition you see similar trays returning for works such as Wall of Rituals and Vertical Altar. 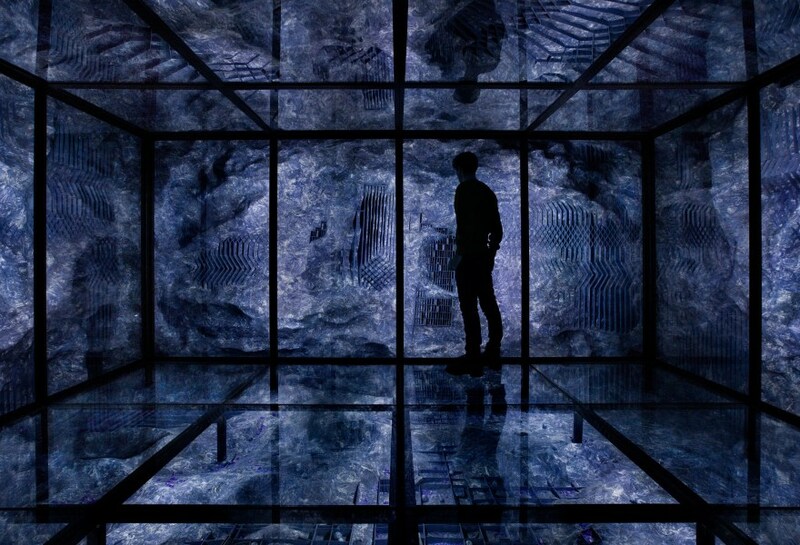 The highlight of Beyond Matter is without a doubt the Beyond Matter Installation. In a separate room, which can only be entered through a sparsely lit corridor, Levi van Veluw has made an installation that contains two worlds in one. As if it is an archaeological site, every gray-blue wall is covered with a steel frame with glass plates. It is precisely this archaeological dimension and the fact that you are in an enclosed space that gives you the sense that you’re in a sacred place where silence is appropriate. At the same time, Van Veluw seems to emphasize through the Beyond Matter Installation that religions use architecture to give believers the idea of a religious experience. “The installation is actually a bonus for the audience. There’s only a small chance that I will sell the installation," says Van Veluw. “After all, who has room for an installation of this size?” The question then remains why you would still produce such an installation if you already had to pull out all the stops for the other works. Van Veluw's answer is illustrative of an artist who continues to look for new ways to tell his story. “The fact is that as an artist you are typecast. When photographing, you will only be asked for photography exhibitions. By showing that I am producing such installations, I hope to be commissioned more often for such projects. This approach seems to be working well, because a new 300m2 installation will open in Italy on April 27, and another one at Zaandam’s new museum Het Hem in December.